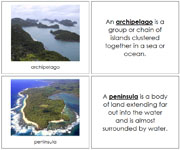 Describes 10 simple land and water forms with photographic cards. 10 Simple land and water forms with photographic 3-part cards. Describes 6 parts of a mountain. 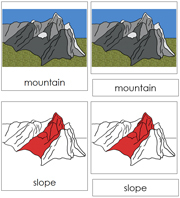 6 Parts of a mountain in 3-part cards, includes black-line master. Fact cards and picture cards of mountains. 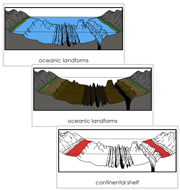 8 Oceanic landforms in 3-part cards, includes black-line master. Describes 9 parts of a river.